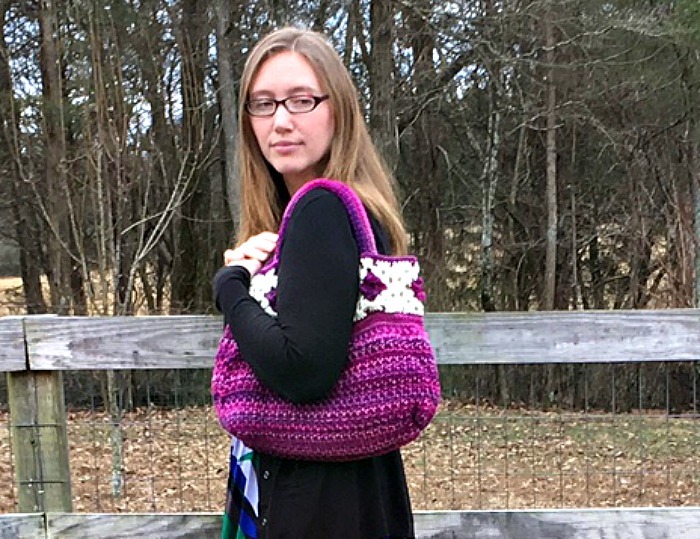 Unforgettable Tote - Free Crochet Pattern - love. life. yarn. I love designing bags. They are easy to make, beautiful, and functional! When I am designing a bag the first thing I am thinking is that it has to be functional. What good is a bag if you can’t carry anything in it? That’s why I don’t often do crocheted handles. I don’t feel that they hold up well when you have any weight in the bag. This bag is roomy enough for all your essentials and stylish enough to carry every day. 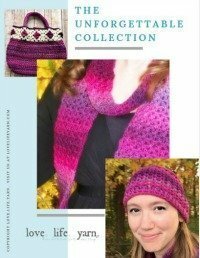 I created it with two of my favorite Red Heart yarns – Unforgettable (I have used this yarn for many designs – crochet scarf, knit scarf, hat, messy bun hat!) and Soft. I adore the Unforgettable yarn (if you can’t tell from the projects!) and love the color changes. I chose the Petunia colorway for most of my Unforgettable projects but I am branching out and using Tidal in the messy bun hat and another project in the works. Notes: Ch 3 at beginning of a row counts as dc unless otherwise noted. With smaller hook and MC, ch 8. Join with sl st to form ring. Round 1: Ch 1, *(sc, ch 3, dc 3, ch 3, sc) in ring, ch 5; rep from * twice more, (sc, ch 3, dc 3, ch 3, sc) in ring, ch 2, dc in 1st sc. Fasten off. Round 2: Join CC in last ch-2 sp, ch 3, 2 dc around post of dc, *ch 2, (dc 3, ch 3, dc 3) in next ch-5 sp; rep from * twice more, ch 2, 3 dc in ch-2 sp, ch 1, hdc to top of t-ch. Round 3: Ch 3, 2 dc around post of hdc, *ch 2, dc 3 in next ch-2 sp, ch 2, (dc 3, ch 3, dc 3) in next ch-3 sp; rep from * twice more, ch 2, dc 3 in ch-2 sp, ch 2, dc 3 in ch-1 sp, ch 3, sl st to top of t-ch. Fasten off. Block squares. Join at sides to form circle. With smaller hook and MC, join at any seam where 2 granny squares meet. Round 1: Ch 1, sc in each st and ch-sp around, join with sl st – 120 sts. Rounds 2-5: Ch 1, sc in each st around, join with sl st. Round 6: Ch 1, *sc 9, 2 sc in next st; rep from * around, join with sl st – 132 sts. Round 7: Ch 3, dc evenly around, join with sl st to top of t-ch. Round 8: Ch 3, *fpdc, bpdc; rep from * around to last st, fpdc, join with sl st. Round 9: Ch 3, *bpdc, fpdc; rep from * around to last st, bpdc, join with sl st.
Repeat Rows 8-9 until piece measures 6” from hook change. Row 1: Ch 3, *fpdc, bpdc; rep from * for 46 sts, fpdc, turn – 50 sts. Row 2: Ch 3, *bpdc, fpdc; rep from * to last st, bpdc, turn. Row 7: Repeat Row 1. Fasten off. Sk next 16 sts. With larger hook and MC, join yarn in next st.
Repeat Rows 1-7 for other side of bottom. Fasten off. Using smaller hook and MC, join yarn to top right corner. Row 1: Ch 1, sc in each st and ch-sp around, join with sl st – 120 sts. Row 2: Ch 1, sc in each st, join with sl st. Fasten off. Using smaller hook and MC, ch 9. 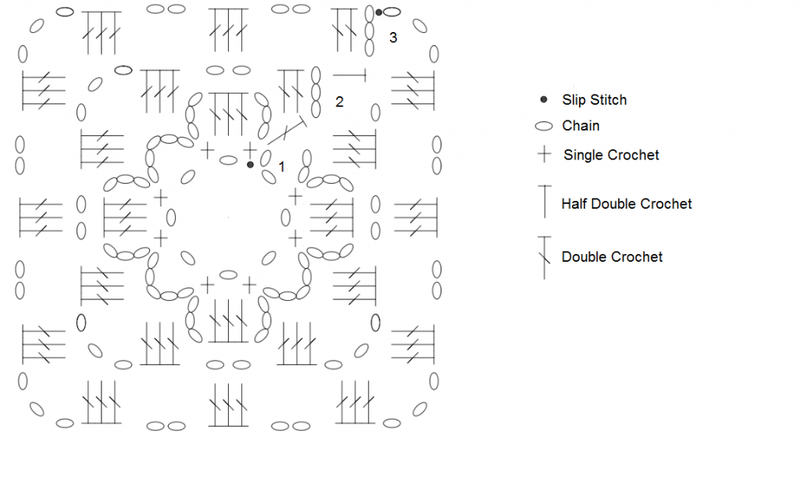 Row 1: Sc in 2nd ch from hook and each ch across, turn – 8 sts. Repeat Row 2 until piece measures 19” from beg. Fasten off. Place rope inside handle and sew long seam around rope. Sew ends shut. Sew handles inside to bottom of granny squares as seen in photo. Sew button to top of bag in between handles. Using smaller hook and MC, join yarn opposite button. Row 1: Ch 8, sk 4 sts, sl st in next st, turn. Row 2: Ch 1, sc in same st, sc in each ch, sc in join – 10 sc. Fasten off. Sew bottom seam. Fold corners and sew corner seams. What’s your favorite thing to make with RH Unforgettable yarn? Leave a comment below. 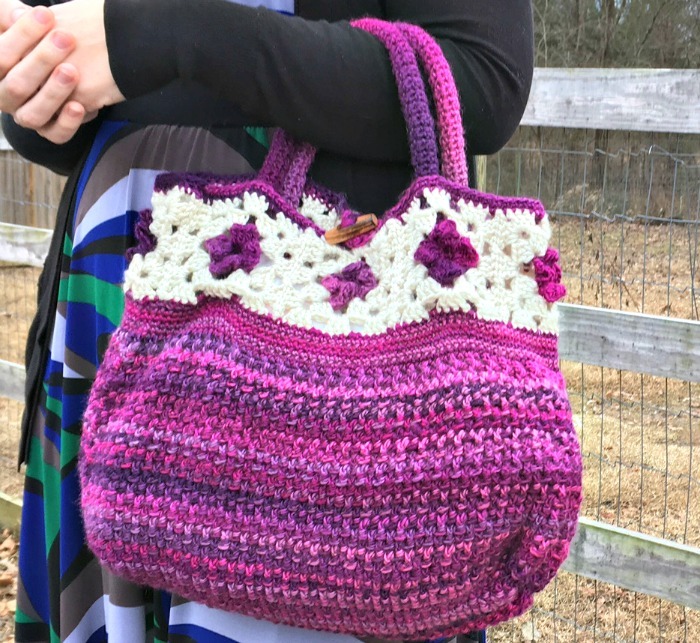 *This pattern originally appeared in the August 2016 issue of I Like Crochet. love your patterns. I find it a bit hard to be able to make these as the yarn needed is not available in Australia. Is there anyway I can find an alternative in yars available here.? Wow! What a gorgeous bag! I really love that stitching on the body of the bag. 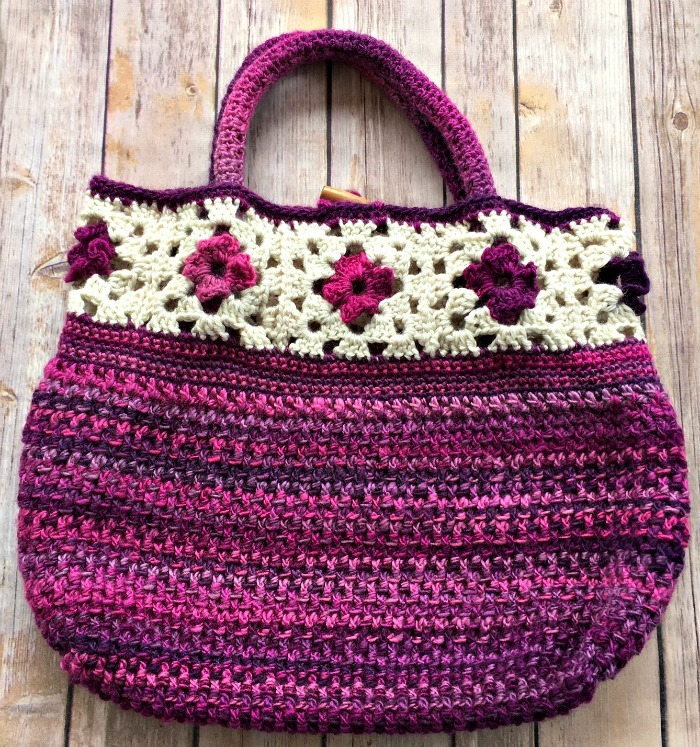 I don’t make too many bags because I feel the need to line, and then deal with the stretching of the handles, but I may deal with the lining to give this one a shot because aside from the stitches, I am dying to try out the handle technique used here. Pinned! BEautiful purse. Thank you for the pattern. I’d like to print these patterns. Any way to do this? I don’t find a print icon . I, too, would like to print this pattern, How can this be done?